WERA-027: This project continues to demonstrate its success in coordination of potato varietal development. Several new varieties with improved performance are released annually by project participants, yielding profitable and sustainable production for the grower; improved competitiveness of the U.S. potato industry; a healthy, inexpensive food supply for American consumers; and an improved environment. 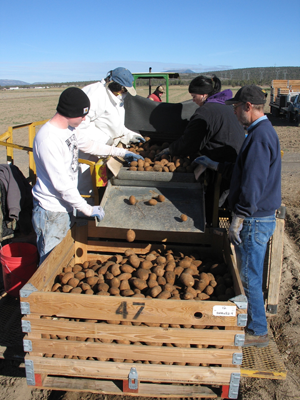 Issue: U.S. potato growers face many economic challenges, including foreign competition, changes in consumer preferences, new environmental regulations, loss of crop-protection chemicals, increased input costs, new pest and disease pressures, and unpredictable growing conditions. Potato varieties need to be continuously improved to meet the changing conditions and demands of the industry and the consumer. The value of new varieties comes in the form of improved quality and marketability, increased yield, and reduced inputs due to disease and pest resistance and improved fertilizer- and water-use efficiency. In a typical year, various state experiment stations, often in cooperation with the USDA-Agricultural Research Service and industry representatives, evaluate the productivity and quality of potato clones in hundreds of trials. Particular emphasis is placed on selecting varieties that have adaptation to local conditions; dual utility, with use in fresh and processing markets; production efficiency; and multiple disease resistances. 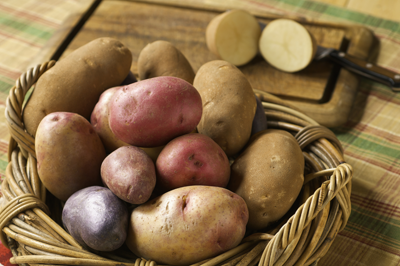 Several new varieties have been released by the Tri-State Potato Variety Development Program. For example, in 2007 two varieties were released, including A88338-1 and A84180-8. A88338-1, released in 2007, is a late-maturing selection with medium to heavy russet skin. U.S. No. 1 yields of A88338-1 were 78%, 42%, 42%, and 17% higher than Russet Burbank in eastern, western, and central Idaho and Oregon, and Washington, respectively. Specific gravity and processing quality are similar to Russet Burbank. A88338-1 has much better resistance to Verticillium wilt, potato leafroll virus (PLRV), common scab, and soft rot than Russet Burbank, making it a good candidate for organic production. It also has good resistance to blackspot bruise. A84180-8, released in 2007, is a late-maturing, medium-russet cultivar with good culinary quality and good potential for the fresh market. U.S. No. 1 yields for A84180-8 were 26%, 11%, and 10% higher than Russet Burbank in eastern Idaho, western and central Idaho, and Washington, respectively. It has good resistance to internal and external defects and has high vitamin C content. A84180-8 is more resistant to common scab and Verticillium wilt than Russet Burbank, but it has similar susceptibility to foliar and tuber early blight. It also is less susceptible to soft rot and PLRV than Russet Burbank. The Colorado program named two cultivars in 2007: Canela Russet (AC92009-4RU) and Rio Colorado (NDC5281-2R). Canela Russet is a fresh market selection with a medium-high total yield and excellent tuber type. It has a low level of external and internal grade defects. Tubers have a long dormancy, minimizing the need for sprout inhibition in storage. Rio Colorado is an early-maturing red developed for the B-size market. 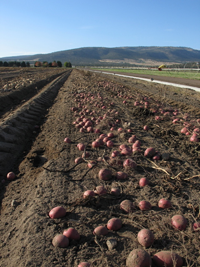 Rio Colorado has excellent tuber color and color retention in storage compared with many popular reds in the marketplace. Tubers have good storability, with minimal external and internal grade defects. Field trials being harvested and sorted. Continued variety development using germplasm that will allow for selection of varieties with resistance to classical pests as well as to several new pests and that will provide high performance under environmental stresses in our regions. Other research should focus on the needs of the processing industries for new varieties with improved quality and marketability.